The Crosby-Huffman Chamber of Commerce met at the Crawfish Kings on FM 2100 on April 17 and heard from Commissioner Jack Mormans Precinct 2 Senior Director of Infrastructure, Jeremy Phillips, concerning the status of FM 2100 being widened to accommodate increasing traffic in the area. The Crosby-Huffman Chamber of Commerce is proactive in facilitating dialogue and understanding of community development. As usual on the morning of the meeting at near 6:00 a.m. near Foley Road traffic snarled on FM 2100 at red lights. Mormans Precinct 2 crews are now beginning to give more time for drivers bound north and south to ease the tie up. Still there is no as yet plan to begin widening between Crosby and Huffman and from Barrett Station to Highlands. In a substantial list of efforts applied by the east side of Harris County Precinct the first shovel will fall from the Texas Department of Transportation (TXDoT) to widen FM 2100 from the U.S. 90 overpass to FM 1942. From that point Mormans Precinct Engineers are planning on widening the roadway all the way through Barrett Station. The plan is to put culverts down and roadway over those culverts to get more lanes. The Precinct 2 portion of that project is $7 million. Daily, the drive through Barrett Station is a slow pace from about 4:00 p.m. until about 7:00 p.m. and that compounds once one reaches Crosby. Precinct 2 expects bidding to begin the first of next year for the TXDoT portion of the roadway. If they can do that, then were going to be right on course with them to try to get our portion done as well. said Phillips of when the County portion might begin. Mormans Precinct 2 crews lack about one quarter of the project being finished in front of Newports bridgeway entrance including new lighting. 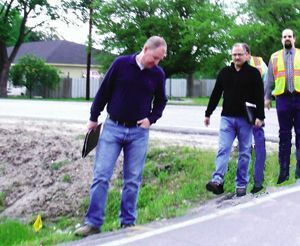 Precinct 2 completed a drainage study and is designing new relief for flooding. Precinct 2 has worked with Crosby ISD to facilitate mobility for buses throughout the district. Dr. Keith Moore, Superintendent complemented the Precinct on their responsiveness to issues addressed by the school during the Luncheon. I.T. May Park and Riley Chambers Park in Barrett Station are to be getting some county funds for varied projects. Riley is to get a new press box. The I.T. May will get about a million in improvements. HARRIS COUNTY  Accused and self-confessed murderer Ethen Drake, 23, has killed himself by suicide, according to authorities and the victims family. Drake was in Harris County Jail on suicide watch, but apparently he managed to hang himself last Friday, April 4, and was taken to the hospital where he died on Monday, April 7. Drake was the accused killer of Caroline Sue Stagner, 72, who allegedly entered her house on Clear Lake Road early in the morning on Dec. 13, 2013, with the intent of robbing her. However, what started as a robbery became a murder by stabbing, perhaps after she awakened and discovered Drake in the house. He then set a fire to conceal the murder, which quickly engulfed most of the house. Stagners body was discovered by Highlands firemen as they fought the blaze. Stagners family was informed of the suicide hanging, and also that Drake had confessed to the murder, according to a family spokesperson who spoke to the Star-Courier. Family members stated that they felt the Sheriffs department had been diligent in their investigation, and conveyed information regularly to the family. Drake had been arrested in January for the murder, after some of Stagners possesions and medicine bottles were found by deputies in a burn pile behind Drakes parents home. In addition, Drake was arrested in Gladewater in January for a similar theft and housefire. It was also learned that as recently as this week, Stagners purse was found by children in a drainage ditch on Clear Lake at 7th Street, not far from Stagners house and in the vicinity where Drake lived. The children took it to their school, where Stagners ID and other papers were discovered. The Stagner family has mixed feelings about the suicide, it was learned, because the case will never come to trial and some details may never be known. However, in the overall picture, they are relieved at the closure, and also have been reassured by Sheriffs investigators that Drake acted alone. This is important because the neighborhood has been concerned that others might have been involved, and still would be a threat to residents living nearby. Now the authorities have clearly stated this is not the case, and they can feel safe again. As a result of this murder, another one nearby on 6th Street, and three others in Highlands during 2013, the community has organized crime watch meetings, and small citizens crime watch groups in neighborhoods to help with the patrol and safety of their areas. HOUSTON Three Crosby students were Grand Champions at this years Houston Livestock Show and Rodeo. Teague Schexnayder, Andrew Horacefield for Grand Champion Turkey and Austin Eilers (in the second grade) for grand Champion Rabbits were great representation at the worlds largest livestock show for Crosby along with Tyler Thomas who was fourth in Container Horticulture. Teaque Schexnayder had the first catch in the calf scramble. Teaque ended up winning the Tom Glazier First Catch Award and received a belt buckle and $1500 dollars to buy a calf for the 2014 HLSR. He was required to have 2 essays, a backdrop, monthly reports, and a scrapbook. In the Calf scramble Teaque received several awards such as: -Tom Glazier First Catch Award with a belt buckle and $1500 -Good herdsman first place ribbon and $100-Scrapbook honorable mention $50 -Stall display honorable mention $50 -Breed essay 4th place $125 -First in Class $250 -overall supreme scrambler 2nd place with a belt buckle -Division Champion with a belt buckle, banner, and $300-Grand Champion calf scramble steer with a belt buckle, $750, and banner. After winning Grand Champion calf scramble steer Teaque went on to the market steer show. Teaque places 9th in class and went on to the auction to make $7900. Andrew Horacefield wins Grand Champion Turkey with a bid of $115,000. NORTH SHORE  Sheriff Adrian Garcia brought together about 30 law enforcement officers, to report on their efforts to reduce crime and make Harris County the safest county in the nation as voiced by District Attorney Devon Anderson. Attending and speaking were Constables Ken Jones, Chris Dias, and Phil Sandlin, County Commissioner Pct. 2 Jack Morman, County District Attorney Devon Anderson, and Galena Park ISD Police Chief Bryan Clements. Sheriff Garcia spoke about needing more deputies, and in fact with Mormans help he has been able to field 140 new patrol deputies. He has implemented realtime communication with his patrols and investigators. He has sponsored youth Explorer troops to prepare young men and women for careers in law enforcement after public school. Pct. 2 Commissioner Jack Morman said that his role on commissioners court is to help set and approve budgets for county offices, including the Sheriff. He noted that more money has been made available for law enforcement, and 140 new patrol officers have been added. He also said they will be used soon to enforce new regulations against illegal game rooms, noting that their fines and licenses will pay for this enforcement. Garcia closed by reminding all that the reson for the meeting is to hear how his office is performing, and how it can improve. The Crosby Fair & Rodeo has named their total acts for the upcoming concerts after the Rodeo, Cook-Off this June and the Spring Dance next weekend. The Spring Dance for the Crosby Fair & Rodeo is to be held on April 12 at the American Legion Hall. It will be a Traditional Country Dance Hall Music venue featuring Jeff Woolsey. .kept em on the floor. Throughout the 90s, he and the band were one of the hottest bands on the dancehall circuit, playing 150+ dances a year. Jeff released his first single in 1991 and received considerable airplay in Texas as well as other states. In 1994, they were named Band of the Year in the Houston area. Since 2005, Hill Country Jane has been steadily gaining momentum in the Texas/Red Dirt Music scene. Starting out as an acoustic trio in Austin, and now based in their hometown of Houston, Hill Country Jane has evolved into a Texas Country Rockin Blues powerhouse! With the release of their debut LP, The Great Charade, the buzz about this up and coming band grew louder and louder. Then, in 2012 HCJ made some big changes, joining forces with long-time friends and collaborators Chip Oliphant, Dan Payne & Derek Wilson from the local Houston band Last House on the Left. With the right pieces finally in place, the guys went straight to work with producer Billy Hillman of HillTrax Studios in Huntsville, TX, and are currently recording their latest CD Home Grown expected to be released in 2014. Texas born and bred singer, songwriter Abbi Walker Petkoff has been dubbed a Rockabilly songstress sort of a cross between Adele and Miranda Lambert. She will lead for Jason Boland and the Stragglers on Saturday, June 7. She has been landing huge gigs opening up for country headliners such as Jack Ingram and The Charlie Daniels Band, and now she is making her radio debut with the release of her new single Kiss Kiss Bang Bang. The Philip Griffin Band starts the Crosby Fair & Rodeo concerts on Thursday, June 12, leading for Aaron Lewis. Daytons own blue collar, neighborhood band that everybody liked on Friday night after the football game has come full circle to re-play for the Crosby Fair & Rodeo. Griffin grew up on simple philosophies; go to college, get married and the good ol American dream. The rumors spread by people are something of tall tales and fiction. So many of these things are present in the music written and performed by Philip Griffin Band. The bands EP release in 2009 Philip Griffin Band was just the beginning of small town pride and life lived through a young mans eyes. The heart wrenching emotion of a love that didnt last; Left Us Here to the triumph of Watch Me Go; the aspirations of Worth It and the countdown of the betrayal in Running Out of Time. Remaining on the EP is the true ballad of Austin and the honky tonk, two stepping success of How Bout You and Me. Griffins songs have such an emotional draw. The EP was just the beginning of the songwriting and heart and soul of each line that has been sung across the state of Texas. Philip Griffin Band has performed at many venues considered to be staples for Texas Music. The list includes; Goodes Armadillo Palace, Firehouse Saloon, Shiners Saloon, Bandera Saloon, River Road Icehouse, Tavern on the Gruene, Shotzis, Josabis, The Cow Pony, Falcon Club, House of Blues (Houston), Big Texas (Spring), Crosby Fair and Rodeo, Jackson County Fair and Rodeo, and 100s more bars and honky tonks. Philip Griffin Band released their second album, Burning Bridges. Breelan Angel of Baytown will lead for Fridays rodeo concert. The Turnpike Troubadours are headliners. Breelan is a self-described steel magnolia and Its My Turn is a personal testament to her Texas-gal determination. Showing off her talent as a vocalist and a songwriter, Breelan chose this as her debut single from the forthcoming album of the same name because of its strong message. Breelan showed off a God-given natural talent at the early age of three when she began ballet, tap and jazz. As she grew older, she took piano lessons for a time and also performed in choirs and theater productions crafting and developing her vocal talent, demeanor, and stage presence along the way. After working with renowned vocal coach Tom McKinney, Breelan took the next step toward a music career by recording two EPs and making several trips to Nashville to work on her songwriting skills. Before dashing and penache Kevin Fowler takes the stage on Saturday, the board of the Crosby Fair & Rodeo has a treat for the guys. Charisma to spare, camera-ready looks and dreamy country singing voice says Charla Corn is soon to be Country Music Queen. Style, and substance got her named best female artist in 2011 Texas Regional Radio Awards, Corn has two CDs More Than I Should for 2009 and Stella. But after giving it a shot in Nashville, shes back in Texas  the small-town girl with big dreams hoping she can rise to the top of the male-dominated worlds of Texas Red Dirt music and country radio. Shell tell you God makes things happen for her, but shes also doing plenty to propel her career forward  including a radio show and hitting the road on weekends to play gigs with her band the Trainwrecks. If she doesnt make it big, it wont be for lack of trying, says her brother, Clayton Corn, an Austin-based music producer/manager who played keyboards for Pat Green for seven years. For Charla Corn, who has been singing as long as she can remember, it was a great place to grow up. She performed at the towns Border Town Days festival every year, and in high school, she started playing guitar, singing at church and competing in beauty pageants. She began honing her songwriting skills at South Plains College in Levelland, less than 90 miles from home and about a half-hour west of Lubbock. Its a commercial music college, where you can actually get credit for singing songs and going onstage and recording. Corn says. 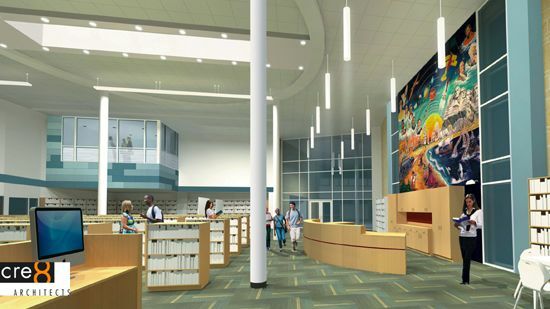 Crosby High School will not have a library as we think of one now, because the term obsolete applies to the concept of library that has mostly been extant since Socrates was questioning What do you know? and being made to drink hemlock because he made young people think. No, the library of the future is called a Media and Research Center because the student most likely walks in with a devise such as an electronic tablet maybe an outdated lap-top or smaller smart contrivance that connects them to an entire universe of information. It must be difficult to predict then needs of three decades in the future of education. Yet efforts to make a modular and adaptable learning center are underway. Few predicted the burning of the library at Alexandria by Julius Ceasers troops would be an educational catastrophe in first century education because irreplaceable ancient papyrus blazed. But there will be far fewer books (but some) at the Media and Research Center because information is less stored in that outmoded papyrus fashion. Lets go back just 35 years to when this reporter was in college, there was one massive computer at my college and those of us taking calculus and physics had to reserve time to work on the computer and then learn to write a program. Probably the oldest computer still working in this area could run circles about this multiton featureless cube. Then working with binary code (ones and zeros) students could make the 8 inch by 11 inch display show something. I made a cannon fire a ball on the interval from zero to 100 owing to a formula. I have never written binary code since and have never written a program since but have used computers most of my working life. The college had me learn to do these things to prepare me for the future. A future where the petty skills I learned would be pathetic parry to proficient attack of a maturate diabolism raging to disesteem any of less than hyper-modern erudition of technology to wretched poverty. But, I digress. The adaptations of the Media and Research Center is that yes there is planned to be some of the latest and greatest gadgets like a three dimensional printer but mostly it is where students will bring their apparatus and contrive with collective appliance to work together to learn lessons. The Media Center has to be a place for collaborative learning so it has to be adaptable for coming technology, said Dr. Keith Moore. He indicated that there are to be two types of lecture halls within its confines and that the architecture must be malleable and adaptable including tables and chairs with casters to be easily moved around for realignment. The structure will be within two stories one of greatly open area with much natural light and a smaller area with a more personable and interactive setting. The simple fact of the matter is that whatever devises or hardware they purchase will be outdated soon thereafter in a exceedingly expansional unfolding of knowledge technology. The Media and Research Center is outside the overwhelming Technology Learning Center that will also occupy two stories. The goal is technological integration and with that personalized learning will be facilitated to the students own capabilities in an effort to keep pace with a slight edge on worldwide proliferation of knowledge.